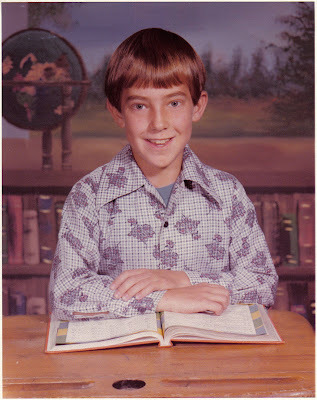 This is an elementary school pic back in the days when it was okay to have a bowl-cut (please don't do this to your kids). I swear, if I had pointy ears, I'd be a dead ringer for Mr. Spock. LOL, I thought the bangs looked cute on you!! Great pic for a fun FF. Oh John, you are too funny! But this photo looks like you are so serious about your studies! LOL! Are you out of your vulcan mind? nice cut! i have similar cut like that when i was a kid too and many mistakes me for a "boy" wow! i just hate to hear it but i did love my hair. i like the egyptian hair cut. I rather like your "helmet head"...as you called it! ((smile)) You were right in style back then. And it's funny how stylkes come around again eventually! Thanks for your comment on my blog post. Yes,...I am rather long winded. But when you are my age you have lots of memories stored up! Nice photo, it's fun to see old pictures, right? Have a nice day Cottrill Family.